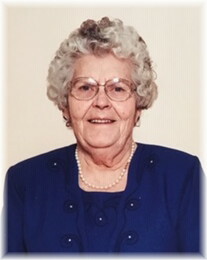 Peacefully on March 29, 2019, Mom passed away at the Lac du Bonnet Personal Care Home with many of those who loved her by her side. Mom was born on January 20th, 1924 on the family farm in the Maple Creek area, one of seventeen children. She often regaled us with stories about her siblings and her adventures with them. We greatly enjoyed these as we were growing up. Mom was predeceased by her husband Napoleon Jenvenne, her son Ralph, and her daughter Yvonne Henry (Les). She is survived by her husband Paul Julien. She also leaves behind her children, Virginia Hodge, Rose Marie McLeod, Celine Storrier, Terri Schwartz (Bill), Fern Kost, Art (Brenda), Louis (Charmian), Mike (Kataisee), Louise Stroet (Adrian), and Marc (Louise). She was blessed with grandchildren, great-grandchildren and great-great-grandchildren. Mom had many wonderful attributes. She was a loving wife and mother, a whiz at board games, an avid reader and a fabulous cook. She was renowned for her tourtière, fruit pies and chicken in cream sauce. Her homemade bread and cinnamon buns would have won prizes. All the neighbourhood children loved to be around on baking day. Mom was a very strong woman…one of the strongest women we ever knew. She had to be, and we are grateful for the example she showed us. Everyone has thought of her during their hard times and found the strength to go on. Mom had a sense of humour that always packed a punch. Her children and her sons-in-law all had experience with what she called “baise ma blie” (slang for “kiss my smacker” which she said as she hit them with a lump of unbaked bread dough…It was a Jenvenne thing and it loses in the translation. Very unfortunately, dementia took Mom away from us much too soon except for some treasured moments when her “old self” shone through. Those glimmers of recognition and love sustained us through the dark days. Mom was many things but most of all, she was loved and will be greatly missed by all of us. The family would like to thank the staff at the Lac du Bonnet Personal Care Home for their care and consideration of our mother. It was a great comfort knowing that she was so well cared for. Thank you. You are all so greatly appreciated! Funeral Liturgy will be celebrated on Wednesday, April 3, 2019 at 1:30 p.m. at Notre Dame du Lac Roman Catholic Church, Lac du Bonnet, MB, with viewing 30 minutes prior to service. Viewing will be held Tuesday, April 2 from 7:00-9:00 p.m. at Sobering Funeral Chapel, 1035 Park Avenue E., Beausejour. In lieu of flowers, donations can be made to the Alzheimer’s Society Manitoba, 10-120 Donald St., Winnipeg, MB R3C 4G2. Mom would have been honoured to know she helped, in some small way, in the work to discover a cure for this terrible disease. Very sorry to hear of your mom’s passing she will be missed by everyone. I will remember her for her smiles and big bear hugs. Josie, Bob and Marie Gebauer. I remember your dear mom fondly as such a loving person. She always greeted me with her beautiful smile and a kiss on both cheeks. My sincere sympathies to you all. So sorry to hear of Jo’s passing. She is with Jesus now and her suffering is over. Condolences to Paul and all her family. I was saddened to learn that your Mama, Josépnine, has passed away. Joséphine and Napoléon are part of the Picton family’s stories. It is always with great affection that we remember Joséphine and her family. For me, it is the times that we visited as children, and watched with envy the Jenvenne kids swim in the lake along the dike that was close to the Jenvenne home. It was also the time that Raoul ran after Louise, and tried to steal a kiss from her. I also remember, vividly, a very mischievous Joséphine teasing Yvonne, because she was wearing a pair of short shorts, and Yvonne, crouching down, trying to stop her…”aah, Mama!”. To Paul and the Jenvenne family: May you find solace and comfort in your special memories during this difficult time. Our sincere condolences to Paul and Josephine ‘s family. Josephine was such a wonderful woman, always greeting you with her loving kisses. As you cherish her memory may her light and faith live on as a legacy to each member of her family and for generations to come. God bless you all with His loving Peace.